This is a question that has puzzled people from the beginning. If God is good and all powerful why didn’t he stop Adam and Eve from sinning? Fair question. Of course we all know that he took the risk of giving us free will so that we could choose to love him. I don’t want my kids to be born with a red button on their forehead that I push every time I want to hear them say, “I love you Daddy!” I want them to choose to say it from their own free will. No one wants a robot son or daughter – God included. Today something leapt out that deals with the problem of evil, even though it wasn’t in the section on the problem of evil. It deals with the question of why God allowed original sin to take place. 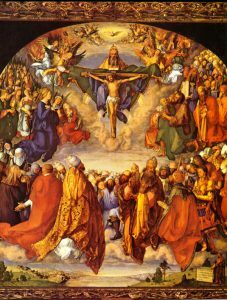 The answers provided by Leo the Great, Aquinas, Paul, and the Exsultet [at Easter] all converge on the idea that God allowed man to fall into sin because he knew he could bring about a greater good by doing so. This does not necessarily mean a greater good for every individual (e.g., people who commit mortal sin and decide to stay there may not end up with a greater benefit in the long run, although this is itself arguable), but it does mean that there will be greater net good in general. Thinking of Jimmy’s words reminded me of another paragraph in the Catechism which has caused quite a stir at times. It deals with the divinization of us humans. Had we not sinned, God would presumably not had to become Man. But when God became Man, though his humanity he drew us up into himself and made it possible for us to be sharers in his nature, to share in the very life of the Trinity! This is not some strange kind of Mormon theology or New Age nonsense. It is the essence of our salvation. We are not just saved from our sins, but we are drawn right up into the very nature of God by the incarnation and redemption acquired through Jesus Christ. If you are not dancing yet, re-read the above and then start dancing and sharing this joyous news with everyone!! What a great post for the season. 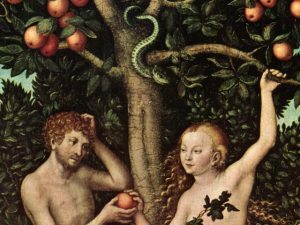 Salvation history started with Adam and Eve and our first rejection of God’s love. His eternal creations have a choice. Let’s pray that most will make the right one. Next post: Did the Wise Men Meet the Shepherds?